Starting where we started, in a 10x10 room, being laughed at, being told it can not be done, and all the door slams...to go from that to the Inc 500 top 35 two years in a row is the ultimate grand prize for any entrepreneur. Big Block Realty started in a 10 x 10 room with a couple of small desks, a white board, and a vision. Today Inc. magazine ranked BIG BLOCK REALTY in the top 35 fastest growing companies in America for the second year in a row. Others on the list have included powerhouses Yelp, Pandora, GoPro, Dollar Shave Club, LinkedIn, Zillow, Zappos and many other well-known names gained early exposure as members of the Inc. 500. 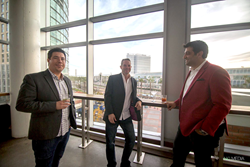 Oliver, Sam, and Spencer, founders of Big Block Realty, had one vision: create a brokerage for agents built by agents. In just 5 years they have grown their unique 100% commission model brokerage into the fastest growing real estate company in the country through innovation and a vibrant, fun corporate culture. "What got us on Inc 500 in the top 35 two years in a row is two fold. 1: Our culture. 2: We really love our agents. We go above and beyond for them. We don't just say that we do, we actually do. We have social events, agent concierge, training sessions, and so much more to help them succeed and plug in on every level. Because we are taking such good care of our agents, the word of mouth is creating an incredible buzz." Says Oliver Graf, President of Big Block Realty. He adds that, "Starting where we started, in a 10x10 room, being laughed at, being told it can not be done, and all the door slams...to go from that to the Inc 500 top 35 fastest growing companies in America two years in a row is the ultimate grand prize for any entrepreneur." What makes Big Block Realty so special? One word: leadership. They know the struggles of a start-up. It was within those struggles that they discovered the value of making difficult decisions and how those would ultimately contribute to their outstanding accomplishments. 1. They share their vision clearly: Effective communication is the cornerstone of success for this executive team. Every step of the way, through the leanest of times and every celebratory moment, communicating with staff, agents, and each other is a key element to their successful rise in real estate. 2. They broke the mold...unapologetically: these savvy and bold entrepreneurs stuck to their vision of building a place to be, work, and succeed as agents themselves focused on authenticity. 3. They are available to staff with the intention of listening: empowering employees, and even agents, to think outside the box, championing internet marketing and social media to help agents grow their business in new ways, and listening to their ideas has created an environment where creativity and teamwork thrives. 4. Their motto is all about love: their philosophy is that when you lead with love, they will love what they do and where they work with 100% commitment. 5. They never stop learning: Sam Khorramian, CEO of Big Block realty, says it best, “We are where we are because of the books, seminars, mentorship, and mastermind programs we immerse ourselves in. We strongly encourage our team to do the same." Their choice to be different, remain open to listening to staff, pulling pranks and playing foosball or shuffleboard, and popping champagne to celebrate milestones they achieve is paying off. Big Block Realty is welcoming new agents at a record pace with 44 new agents just last month and now have over 700 agents hanging their license with Big Block Realty.